Dormitory Housing at UNCC is included in the registration price. Transportation to and from the workshop will be provided June 3-6 (Monday-Thursday). If you plan to ride our shuttle to the venue each morning, please note, the bus will depart from Belk Hall at 8:00 AM sharp. If you plan to drive, the address for UNC-Charlotte is 9201 University City Blvd., Charlotte, NC, 28223. The address for Belk Hall on the UNCC campus is 8938 Cameron Blvd., Charlotte, NC 28262. Hotel Accommodations: Attendees who prefer hotel accommodations can make reservations at their desired location. We recommend the Holiday Inn Express in Kannapolis, NC. Hotel accommodations and transportation to and from the venue are the responsibility of the registrant/attendee. Belk Hall on UNCC campus: If you select dormitory housing when you register, you will be placed in a suite in Belk Hall on the UNCC campus. Full details below. Parking: UNCC housing requires a permit through Parkmobile Registration and will be available starting the week before the short course. Parking at the NGx venue (Kannapolis City Hall) is free. 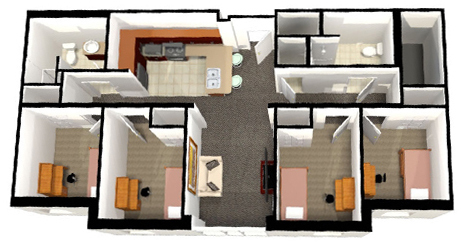 Four-bed apartments will include a sofa, TV stand, two kitchen stools, a small breakfast table with two chairs AND a washer and dryer in the unit. Suite-mates can be requested in registration. We will do our best to accommodate your request. Requests are not guaranteed. *A personal DNA test is only provided with early registration and if you are a US resident. Registrations after this date will receive a standardized sample. **NRI Faculty – if using grant funding, choose “pay by check” and you will receive notification for payment. The UNC NRI is offering a limited number of scholarships to students and postdoctoral fellows. These scholarships include tuition, meals during the course period and lodging at UNCC. To be eligible for a scholarship, you must be a graduate student or postdoctoral fellow enrolled in an academic institute as of the start date of the class. Students graduating in the Spring semester immediately prior to the start date are eligible regardless of actual graduation date. To complete your scholarship application you will need to attach the following documents: Brief Personal Statement (2-3 paragraphs), Resumé/CV, Unofficial Transcript, Mentor Letter (verifying your status as a graduate student or postdoc).